The cables which are designed for use in wet ground or under water, with types specialized for pump environmental conditions is known as Submersible Cable. The Cable needed for this type of application must be durable and reliable as the installation location and environment can be extremely preventive as well as aggressive. Our cable manufacturers keep these factors in mind to achieve the highest possible degree of reliability. The size and shape of submersible cable can vary depending on the usage and preference and pumping instrument of the installer. The conductors are often color-coded for identification and an overall cable jacket may also be color-coded. 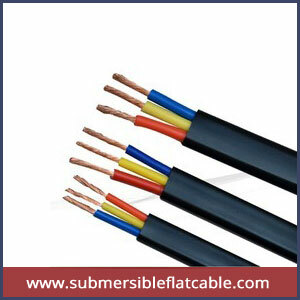 From years we are occupied in offering a premium quality Submersible cable. Our offered range is manufactured using advance technology, new methodology using optimum quality material for submersible cable, these cables are mostly used to co-operate with current industry standards. Also accessible in different specification according to client specific requirement, Submersible cable is shock resistance, defect free, and durable with Flexible Annealed Bare Copper Conductor PVC insulated & sheathed Cables in round, flat type with High resistance.